Even acquaintances of mine will likely know that I am a huge Queen fan and have been so for most of my life. I pledged my allegiance to Queen fanhood in 91′ ~~ the same year Freddie Mercury passed on ~~ and I’ve not wavered since. In my teens it could be reduced to a phase and we’d be sure that I’d grow out of it. In my 20’s I’d tease my mum (who gave me a great deal of grief about them when I was younger) that it is was a phase and I’ll eventually grow out of it. Now in my 30’s I’m telling my wife the very same thing. She’s been so very kind to allow me to dedicate one room in our home to house my collection but I because of that very same kindness, I could not inflict that on her. What a lady tho, eh? I’m not your garden variety greatest-hits fan but rather the have-every-album-on-every-format fan and then some. I have acute over-collecting tendencies to the brim so I simply must put parameters on things I collect otherwise it would be both expensive and limitless. So I try to collect only “officially” sanctioned items ~~ that is items with QPL/Queen Productions Limited stamped somewhere on them. Granted if I see a very interesting, unique, or rare item that is not officially licensed, I’ll certainly pick it up. What’s in my collection? The usual…LP’s, DVD’s, VHS & cassettes. As far as singles go I try to collect 7″ & 12″ that have picture sleeves. I’ve made it a point to never pay for than $7 for those. I’ve got a very interesting and now rare Freddie Mercury doll that was once said to be licensed but was yanked off the shelves because it turned out they weren’t as licensed as originally thought. And one of my favorite items is a 1978 Queen promo mobile for the album “Jazz”. It has a MOST interesting and sweet story behind it which I will tell one of these days. 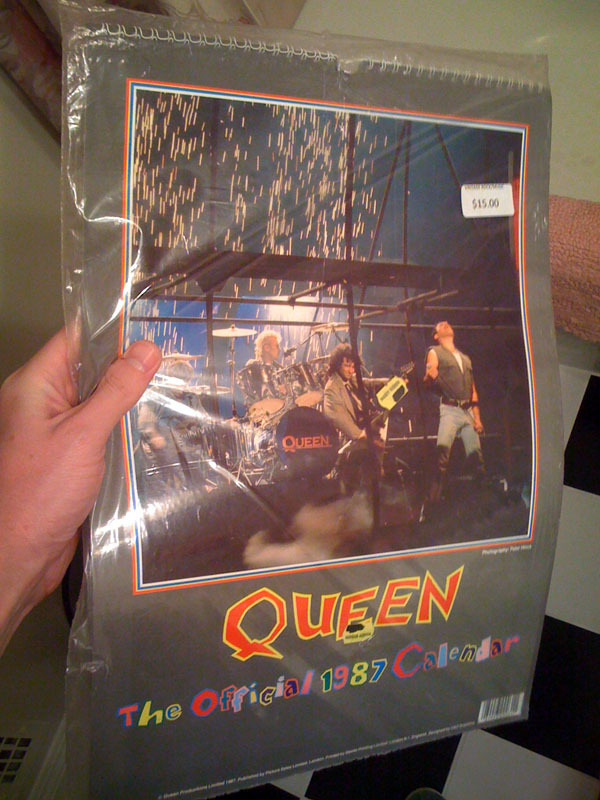 The Official 1987 Queen Calendar, likely put out by the Queen International Fan Club. I found this by accident (the best way to find collectibles) in a $1 book store in Burbank, CA. I went in looking for the True Grit novel by Chuck Portis and came out with this little gem – still plastic wrapped even. So now, this calendar hangs on my wall at work~~twenty-four years out of date but I love it so much more than my Munsters calendar from last year. What sorts of things do you collect and do you have parameters around your collections in order to tame it ? Let’s see…..I collect a variety of antiques, mostly ephemera and old toys or gadgets. Also, lots of Beatles stuff too. I’ve just recently started to setup up parameters to my collecting because let’s face it, where the heck will it all go? If I didn’t have a wife & family, my collecting might grow to unsafe levels. Oh, and by the way, don’t let anyone ever tell you you’re a pack rat. You’re a “collector,” not a pack rat. Agreed, Jacob ~ if it was just me, my house would turn into a museum all things old and insignificant. My wife asks me the other day, “do you think you have slight hoarding tendencies?”. No! I’m a chronic collector!